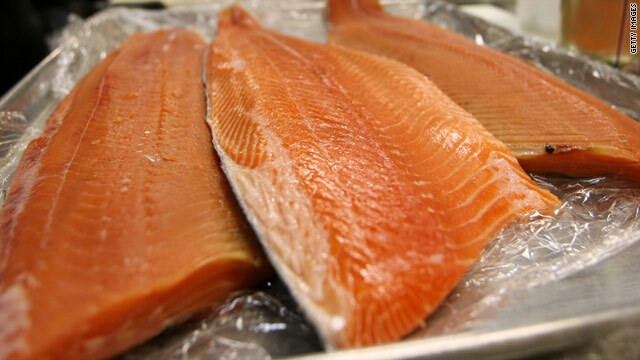 Fish like salmon are rich in polyunsaturated fats, which should replace saturated fats in our diets, two doctors said. (Health.com) -- For years, experts have warned us to cut down on saturated fat -- think butter, cheese, bacon, red meat, and countless other tasty foods -- because it clogs arteries and causes heart attacks. Now, new research suggests all that self-restraint may have been misguided. While saturated fat does indeed raise LDL (or bad cholesterol), mounting evidence suggests that the fat, in and of itself, may not be as bad for your heart as previously thought. But don't rush out to the diner to order a big greasy breakfast just yet. Cutting back on saturated fat is important, but not if you simply replace the calories with carbohydrates -- such as those found in fat-free cookies, cakes, or other types of food. In fact, you need to replace saturated fat with polyunsaturated fats -- the good fats found in nuts, vegetable oils, and fish -- to get a benefit, according to a study published this week in the journal PLoS Medicine. Swapping these fats can lower your risk of heart disease by up to 19 percent, the researchers found. "Saturated fat is not so bad for you that you can replace it with anything and get [a] benefit," says lead study author Dr. Dariush Mozaffarian, the co-director of the Program in Cardiovascular Epidemiology at Brigham and Women's Hospital and Harvard Medical School, in Boston, Massachusetts. "The replacement matters." Although doctors and nutritional guidelines have long advised people to reduce the percentage of calories in their diet from saturated fat, the question of what people should eat instead has remained largely unanswered, Dr. Mozaffarian says. To address that question, he and his colleagues analyzed data from eight controlled clinical trials in which more than 13,000 people replaced saturated fat with polyunsaturated fat in their diets. Polyunsaturated fat accounted for up to 20 percent of the calories consumed by the people who were instructed to increase their intake of the fat during the studies; among the people in the control groups, it accounted for just 5 percent of the calories consumed, on average. For every additional 5 percent in total calorie intake from polyunsaturated fat, the study participants' risk of heart attack or heart-related death fell 10 percent, the researchers found. And the longer people stayed on a diet rich in polyunsaturated fats, the greater were the benefits to heart health. "With all the focus on fat and saturated fat and cholesterol, we've put a lot of junk in our diet instead," Dr. Mozaffarian says. "What a person needs to do is to eat the appropriate amount of calories, and eat a healthy, balanced diet." Despite the fat's apparent ill effects on arteries, studies over the years have failed to consistently show a link between saturated fat and heart disease, and the review put an exclamation point on those inconclusive results. After analyzing 21 studies that included nearly 350,000 people, the authors found "no significant evidence" that eating more saturated fat increases a person's risk of heart disease or stroke. Dr. Ronald M. Krauss, of the Children's Hospital Oakland Research Institute, in Oakland, California, and the other authors of that study noted that the longstanding emphasis on cutting saturated fat intake ignores the possibility that some people replace those calories by eating more refined carbohydrates, which can boost cholesterol and contribute to heart disease in their own right. On the other hand, people who replace saturated fat with polyunsaturated fats may indeed improve their heart health, the researchers suggested. Dr. Mozaffarian and his colleagues appear to have confirmed that hypothesis, says Dr. Krauss. "We should be thinking more about being more generous in our allotment of polyunsaturated fats," he says. The Institute of Medicine, an independent organization that advises the U.S. government on health matters, recommends that people consume no more than 10 percent of their calories from polyunsaturated fat. The average intake in the U.S. is even less, around 6 to 7 percent of total calories, according to Dr. Mozaffarian. The recommended limits on polyunsaturated fat intake are based on relatively shaky evidence, he adds, and should be revised. "I agree strongly with the notion that rather than focusing on further reductions in saturated fat per se ... we should be thinking much more seriously about finding ways of increasing our intake of polyunsaturated fat," says Dr. Krauss. Don't interpret the new research on saturated fat as an excuse to go on a bacon cheeseburger binge. Dr. Krauss says that to conclude that saturated fats aren't harmful is a big oversimplification. "To extrapolate from our analysis about saturated fat to all foods containing saturated fat is a direction I think we need to move away from," he says. For one thing, he explains, there may be other unhealthful ingredients lurking in saturated fat-filled foods. More generally, he adds, emphasizing dietary patterns and their relationship to disease -- rather than a tight focus on certain aspects of food chemistry -- is likely to lead to a better understanding of nutrition and health.